Written by Colleen Sedgwick on February 24, 2016 . Posted in Multiply. Going from being an independent pet sitter to hiring your first pet sitter can be a tricky, but with a simple mindset shift and a couple tips I am going to make it much easier for you! You must be crystal clear on who it is you want to attract to work with your pet sitting business and your clients. You need to write it down so that you can imprint it onto your subconscious. 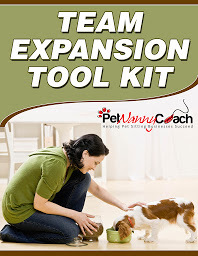 If you want to look at mine, you can grab my Team Expansion Tool Kit here. In short, you want to target people who don’t need your business as their sole source of income. It’s just not going to be enough for people to live on. If you do hire these individuals, you can expect a large amount of turnover. Have another part-time or full-time job that won’t interfere with their pet sitting duties. Teachers make excellent summer pet sitters. Depending on how old their children are. Those with very young children don’t usually work out. Write a written Detailed Job Description explaining exactly how the position works. In the Job Description make note of who the position IS a good fit for. In the Job Description make note of who the position is NOT a good fit for. Reiterate all of the points of the job description during the face to face interview. Do you understand that I can not promise you a certain amount of business? Do you understand that you will be building your book of business by absorbing the new business that is coming into the company and that we do not have a crystal ball that will tell us how quickly that will happen? Do you have the availability and flexibility to be a part of a team like this? So there you have it. Two simple tips that will help the process of going from an independent pet sitter to hiring that much easier of you! TIP: If you would like some more step-by-step information on when to hire your first pet sitter and how to do that exactly click on over here. This video and post will help you. Create an Ideal Sitter Profile so you can become crystal clear on the type of pet sitter that you want to attract to your business. Write a Detailed Job Description that you can email to prospects that explains the position and manages their expectations right from the start. ENTER your information below to save your spot on the waitlist.